Container gardening or pot gardening can be ideal in restricted spaces such as small backyards. Instead of raising plants in the ground you grow them in containers. These could be anything from commercially-made ceramic pots or wooden planters, to re-purposed items such as buckets, tubs, old watering cans, half barrels, plastic and wooden crates, and rusty guttering. We've even seen old bath tubs, wheelbarrows and kitchen sinks used to create a decorative container garden with a difference! Almost any receptacle can be used, and to great effect! Many different types of plants can be raised in pots. You can grow your own flowers, vegetables, herbs and small trees. All are possible, and with little or no conventional garden space. Container gardens can be created on window sills and balconies, on walls and fences, patios, decks and almost anywhere in your backyard. They are an easy way to bring color and personality to your own private space. What Do I Need To Start Container Gardening? The great advantage of this type of gardening is that it can be enjoyed in any small backyard where space is limited, or where there is no established in-ground area suitable for planting, such as in a fully cemented yard. They are also useful in yards where the existing garden soil is poor in some way, or the ground is boggy. Sometimes a deck or patio can appear a bit bare, and the addition of some planters with flowers or small shrubs adds that extra something that gives the area more color and character! These gardens are perfect for anyone who wants plants in their backyard but does not want to be tied down by too much routine maintenance - someone who appreciates plants, but is not an out-and-out gardening enthusiast, perhaps. They are beneficial to elderly or disabled people who cannot stoop to ground level, and for teaching children about plants, in a small way. From an aesthetic viewpoint, plants in containers can be used to create focal points in a yard, separate different areas, and disguise unattractive yard features, like a drain cover or trash cans. They can be repositioned very easily during the seasons so as to change the character of your yard. Container gardening is straightforward, and very easy to get started. You need plants, a container, the right soil, water and nutrient combinations, and sunlight. Some aspects of gardening are fundamental to all the different ways of growing plants, whether in the ground, in raised beds or in containers. Factors such as light and shade, drainage and soil quality and plant nutrition, all have a bearing on how successful your efforts will be. Container gardening does require some considerations in these areas if you want your gardening to be a success. Plants need air, water, sunlight and nutrients to grow and flourish. The plant roots anchor it to the ground, and absorb nutrients and water from the soil. They pass these along the stem of the plant which grows the leaves. The leaves absorb sunlight and carbon dioxide in a process called photosynthesis, which together with the water and nutrients taken in by the roots, feeds the whole plant. The roots will seek out water in the soil, and the upper parts of the plant bend to face the sun to absorb as much light as possible. As the plant grows it will develop flowers. These contain the reproductive organs called the stamen and stigma. When these have been pollinated, seeds will be produced. The amount of sunlight and shade that your backyard receives will influence the selection of plants for your container garden. Plants need varying degrees of exposure to sunlight. When you buy them, either as seeds or as growing plants, they'll be tagged with information about their sun and shade preferences. These will range from full and partial sun through part and full shade. Full sun - 6 hours of direct sunlight is needed by plants per day. Part sun / Part shade - 3 to 6 hours needed but not during the hottest part of the day. Full shade - Less than 3 hours of direct sunlight needed per day. Before planting anything you'll need to know where the sun falls in your yard throughout the day. Make some rough sketches of your yard - enough to cover the day from two hours after sunrise to about an hour or so before dusk - and then every few hours mark the areas that are in light or shade on a different sketch, making a note of the time, as well. When you have a clear idea of the sun and shade spots in your yard, you can start to plan the types of plants to grow. The soil you use in your pots and containers should be different to any garden soil you may have, or any compost made in your own composting bin. These soils are not suitable for pot gardening as they are not up to the job. They are too dense to be effective because their water and air retention is poor when used in the confines of a pot. You'll need to use a purpose made potting mix or potting soil to encourage a healthy root system. These specially formulated soils are lightweight and hold moisture. They contain the required nutrients, and allow good aeration and drainage. Manufacturers use different formulations based on the types of plants to be grown. You'll need to buy based on your own preferences for flowers, veggies, herbs or shrubs. 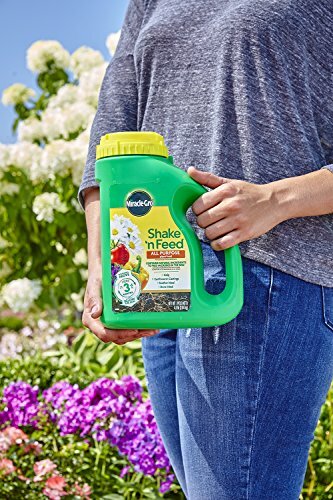 An advantage of using these special soil mixes is that you won't be transferring any plant disease, weed seeds or insects when you plant up your containers, as you might with soil transferred from the ground. Good drainage is important in any form of plant container. Plants need water to survive and the soil needs to retain moisture. However, excess water must be able to drain away so the plant roots can breathe, and to ensure the roots don't become waterlogged, and rot. Any pot or container being used, must have sufficient drainage holes in the bottom to allow excess water to run off. If you are using a container without any, you will need to drill a few holes through. You can use any type of container for your pot garden, whether traditional or unconventional. If it is the appropriate size for the plant you will be growing, and it has adequate drainage, it should be fine. You can save a lot of money by re-purposing old items to use as containers. This is a lot easier than you might think. Old seed boxes, watering cans, wellies, tin cans, 5 gallon plastic tubs, pallets and hollow cinder blocks for example, are just a few ideas of what could be used to make distinctive and unique plant displays! When you buy outdoor plant pots you can spend big on some of the large commercially produced containers, so make sure you know exactly what type of container garden you want before you start forking out your cash. The common materials used for planters are clay (terracotta), wood and plastic (or resin), as well as the more expensive glazed ceramic, and stoneware products. Plastic garden containers are cheap to buy, lightweight, durable and available in many colors. 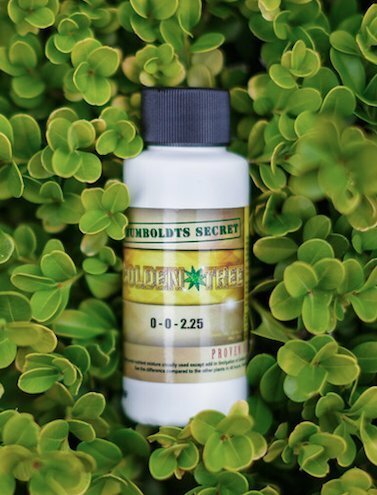 They are non-porous, and suitable for both sun and shade loving plants. Resin types are sometimes molded to simulate more expensive stonework and elaborate designs. They can be easily drilled for additional drainage holes if necessary. Their lightweight makes them easy to move around. Plastic is the cheapest form of pots you can buy. Cheap plastic pots of the kind that nursery plants are sold in. A collection of elegant clay retro planters. Terracotta pots made from baked clay, are the next cheapest type of container. Clay pots come in many sizes and are appropriate for most planting. They are probably the traditional look of gardening, and have a warm natural look to them. They are heavy. Some cheaper types will not be frost-free and can break in freezing conditions. Clay pots are porous which allows air and water through the pot walls, and they can absorb heat which tends to dry plants out, so they will require more watering. Ceramic or stoneware pots are kiln-fired at high temeperatures and are glazed on the outside. This reduces the porosity which therefore restricts aeration, but they don't dry out as quickly as unglazed pots. They are heavy and durable, and most are resistant to freezing but check that before you buy! The colorful designs makes them an attractive choice for the yard. Stone and cement pots and planters are well suited for the heavier plants you may choose to have in your garden. They are, however, quite heavy, and will be difficult to move round once planted out, so make sure you place them in the right location first. You can use them for small trees, and they're robust enough not to be blown over in windy conditions, or knocked over by domestic animals. Wooden garden planters can create a traditional rustic atmosphere in your garden. They can be stained or painted, and made in many shapes and sizes. They are not as durable as other containers and may need replacing after a few years. If these are your containers of choice, buy teak, cedar, cypress or redwood types which are more rot-resistant. Free standing baskets can also create attractive focal points in your yard. They will need plastic liners to retain soil and moisture, just as for hanging basket types. They're ideal for planting herbs and salad leaves. 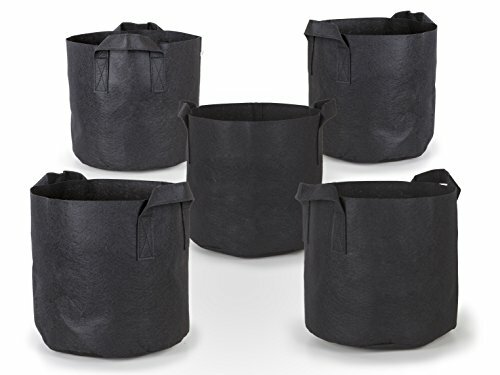 These relatively new, but often large fabric pots, have carry handles (mostly) that allow them to be repositioned quite easily in your yard. They are mainly black, sometimes green, so fairly plain in appearance. Having said that, they are good for veggies, larger plants and for locating at the back of a display with other, perhaps more colorful containers in front. Look after them and they'll last quite a few seasons. These 15 gallon fabric aeration pots with handles are ideal for forays into vegetable container gardening. They do sizes from 1 to 30 gallons. Metal Containers can be lightweight (when not filled with soil, of course! ), generally robust and come in a range of sizes. Galvanized containers such as buckets and tubs, can be easily modified for use as plant containers, by drilling some drainage holes in the bases. Some of these tubs are quite large and can be used to create impressive plant displays that serve as a screen separating different areas of your yard. They're particulary useful for growing tall plants. 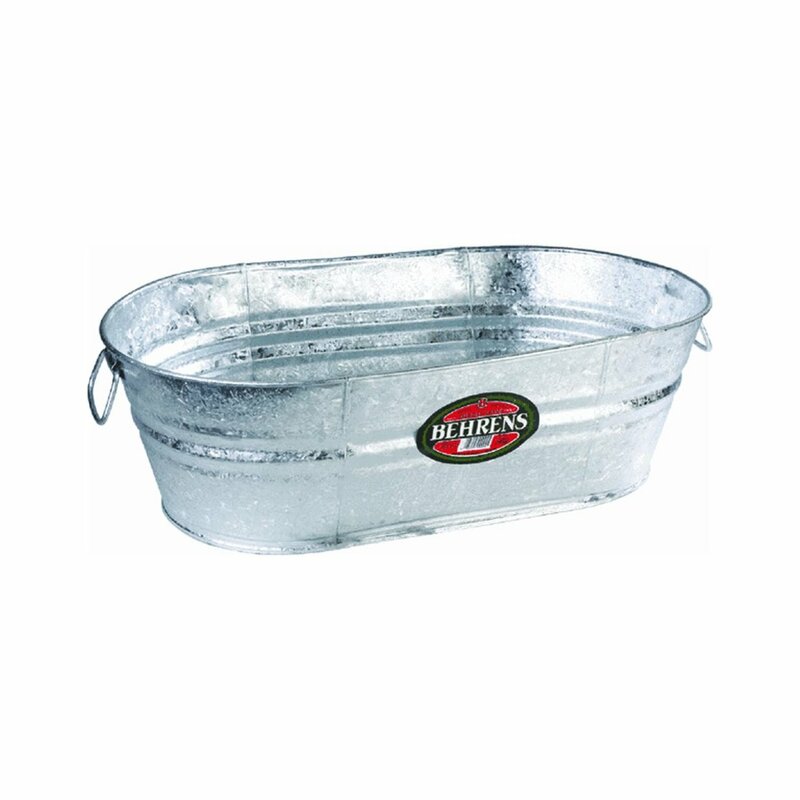 Love these Behrens Oval Tubs. Paint them or use as is! They can be painted, if preferred, to give a decorative finish that matches other elements of your yard, or left in their natural finish. They are probably inappropriate for use in very hot areas, as they will heat the soil too much and can 'bake' the plants! 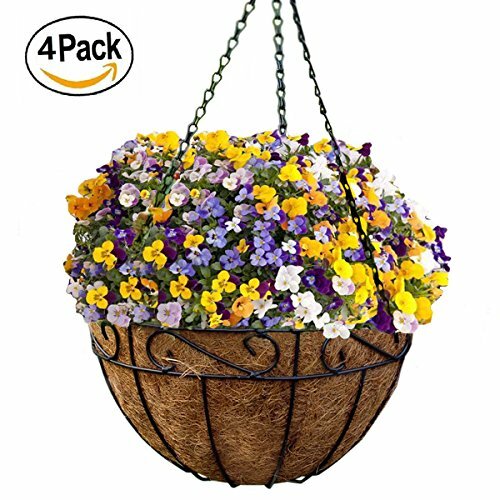 Hanging baskets are another form of container that enable you to optimize the space available in your backyard. These containers are great for plants that trail over the edges. They need liners to retain soil and water, and will need regular watering. Be careful not to position hanging baskets over patio furniture. You will be regularly watering them and do not want water dripping on to where people will be sitting! Good example of 10 inch vinyl-covered metal hanging basket. Supplied with shaped coco liner to retain potting mix, and hanging chain and hook. 4 basket pack. Are they suitable for the job? Do they have eye appeal? Will they be stable when planted out? You'll need to match containers to the various plants you'll be growing, so that they can grow into healthy specimens. The welfare of your plants is paramount if you want a successful and attractive container display. If a pot is too small it will limit root growth. Perennials will require larger pots to grow in, as they will be permanently in your garden. Bedding plants which you'll change annually, can be swapped around in different conatiners in subsequent years. Grow multiple plants in larger containers rather than having lots of small containers. This will make your displays more interesting and help reduce clutter. Above all else, use a range of different container types and sizes, and avoid using just one size of container! The basic equipment needed to start a container garden is very simple compared to landscape gardening. There is no need for large equipment or expensive tools that will require space to store them. In addition to your choice of pots or containers and the plants you want to grow, you'll need a good set of hand tools, and some simple garden supplies. 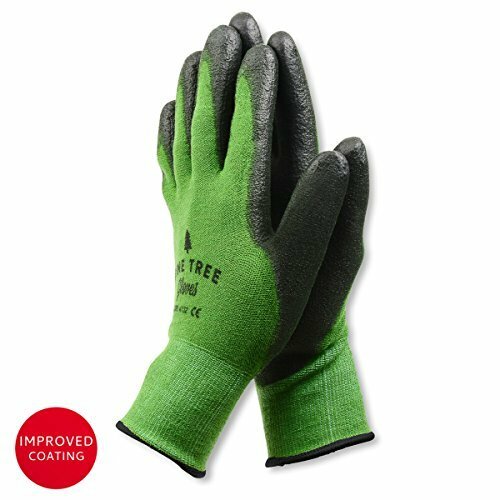 These are needed to help you plant, feed and water your growing containers, as well as maintaining them across the growing seasons. Hand Trowel - just what's needed to transfer potting mix and fertilizers to pots and containers. Hand weeder - you'll get less weeds in containers than in a landscape garden, but their seeds will arrive airborne sometime. This tool will help you clear out the small weeds. Pruning shears / Secateurs - mainly useful for trimming larger plants. Watering Can - You can water your plants using a jug, but a watering can with a rose head applies the water in a gentler way. Get one with a long spout to reach those containers furthest away from you. 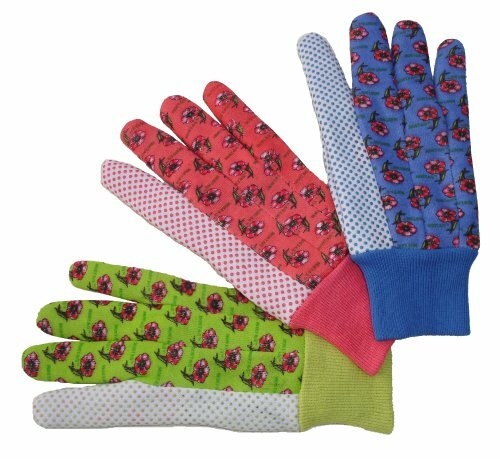 Gardening gloves - you can do a lot of work with your fingers, but gloves will protect your hands from scratches or your skin getting rough, and from soil getting behind fingernails. 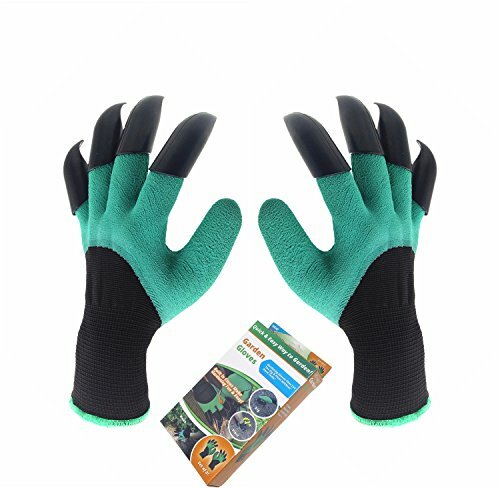 Bamboo Working Gloves for Women & Men. Garden twine and sticks - some tall plants need support, others need tying in place to train where you want them to grow, such as over an arbor or up a trelliss. 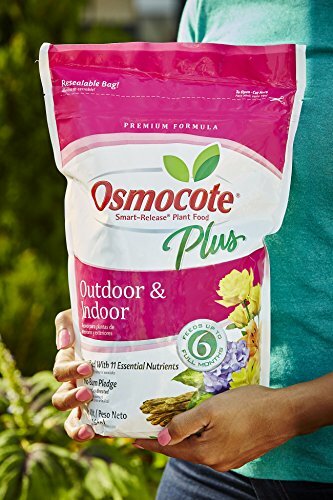 Fertilizer - buy the best quality for the plants you intend growing. Seed starter pots - you'll need these if you intend to grow initially from seeds. You'll use them until the seeds sprout, then transfer the young plants to larger containers for your pot garden display. They're very cheap and often made from a biodegradable material. You can grow most types of plant in containers, within reason. Flowers, vegetables, some fruits, herbs, small shrubs and trees can all flourish in pots, when set up properly. When deciding what to plant, you'll be choosing between 'annuals', 'biennials', and 'perennials'. Annuals are those plants that live for just the one season. They flower, seed and die. Then you'll have to replace them. Biennials grow across two seasons - growing leaves the first year, then flowering, turning to seed, and dying in the second year. Perennials, on the other hand, regrow each year, and last for many seasons. You will also need to consider whether you will be planting out from seeds or from part-grown (young) plants bought from your local nursery. Vegetable and herb seedlings growing in peat pots. Growing from seeds has its advantages. It's much cheaper than buying growing plants, you'll have a wider range of choice of the different plant varieties, and you'll have the satisfaction of creating your container garden displays from just a handful of seeds! On the downside though, it's going to take longer. The seeds have to germinate - depending on where you live you may need to grow them indoors - and then the seedlings need to be planted in their larger outdoor containers. Depending on where you live and the type of plants you intend to grow, and whether you have a shed in which to grow seeds, you may just find it more practical, at least initially, to get started with young plants from a nursery. There are so many different flower types that are suitable for growing in containers. Your best choice initially will probably be amongst the bedding plants, the 'annuals'. These will provide a good splash of color throughout the flowering season, before being replaced the following year. Visit your local garden center and have a wander through all the bedding plants. Look at the tags on each plant to decide what to plant and grow. Some examples of what to start off with include: begonias, geraniums, impatiens (busy lizzies), marigolds, petunias. Growing your own vegetables and fruit is a great way to save money, and enjoy the taste of freshly grown natural foods. You can often grow your own supply of veggies that aren't usually available in your local grocery store. Many vegetables and some dwarf fruit trees can be successfully grown in containers. Just remember that they'll have the same sunshine and water requirements as any other plant. Tomatoes are probably the most productive you can grow in containers, and you could also try lettuce, radishes, spinach, peas, strawberries, raspberries, blueberries, carrots, cucumber, kale, chard, peppers and beans. This is by no means an exhaustive list but a good place to start. You'll need to use large containers for growing vegetables, so make sure you use a type that you can move around if necessary. Herbs are a great addition to a garden, and can be cultivated in many types of container, large and small. Start off with the old favorites like parsley, sage, rosemary and thyme. Then try chives, cilantro (coriander), garlic, mint, basil and dill. Many varieties of herb will thrive in containers, even small pots. Try growing them from seeds in special seed pots, then transferring the seedlings to larger containers. You can plant different herbs in the same pot if you want, as long as the pot is large enough. Mint is one of those plants best cultivated in a pot. It is an invasive species that will spread quickly when reared in the ground. Many small trees and shrubs are suitable for growing in pots, and are ideal for rearing in small spaces. They will require larger pots than flowers, and these need to be stable enough to withstand windy conditions when the plant grows tall. Also, the soil needs to be a heavier type, just to keep the plant stable. They will need more regular watering than trees planted in the ground, to ensure all the soil in a container keeps moist. Some examples of trees and shrubs suitable for container gardening: Azaleas, Conifers, Juniper, Japanese Maple, Bamboo (great for creating a screen), Hydrangea, Roses, Holly. We have a couple of Japanese maples in tubs in our backyard. One red, one green and they look great. Before you get started, make sure all your containers have an adequate drainage hole in the bottom. If you are using old or previously-owned containers, make sure they have been cleaned to remove any possible contamination. And make sure the pot is large enough for the plants going into it. You should not trim a root ball to make sure it fits a pot - use a larger one! Place a piece of landscape fabric over the drainage hole, and cover that with a thin layer of gravel, small stones or pieces of broken clay pot. This ensures that the soil doesn't leak away, it aids drainage, and stops garden pests finding a way in. Add your potting soil. Use the best quality you can and fill the container to about two-thirds full. Now it's time to add your plants. Whether flowers or vegetables, you can either fill with the same plant variety, or have a mix of plant types. But don't mix sun-loving plants with those that need shade, in the same pot. Flowers - With flowers, a good combination is to have one central plant - the main focus of the container - another that will hang over the rim of the pot, and a third (or more if the container is large enough) that adds a bit of contrast. Remove the main plant from it's nursery pot and gently loosen the root ball so it's not one rounded lump. Position it in the potting mix, pushing the roots gently into the soil, and pat more soil around it to keep it in place. Then add other plants in the same way, and top up the container with more soil to about one inch below the tip of the pot. Sprinkle some fertilizer around the surface and underneath the plants and mix in with your fingers. Remember to use larger pots for vegetables, small trees and shrubs. Once your plants have been potted out you need to look after them so they continue to look their best. They will require regular watering and feeding, and you'll need to control pests and to undergo a little routine maintenance. Regular watering is important to all plants grown in containers. They have a limited volume of soil to retain moisture and therefore need a continuing supply of water to stay healthy. Water your pots whenever the top few inches of soil feels dry. You should apply water until it starts to drip out the drainage hole. You can then be assured that the whole volume of soil has been watered. At the same time, don't give them too much water. An indication of overwatering is when the tips of leaves turn dark. Plants need fertilizers to replace the soil nutrients that are routinely washed away during watering. There are a couple of easy ways to feed plants this much-needed nutrition. Fertilizer pellets can be added to the potting mix that 'slow-release' nutrients whenever the plants are watered. These can be either mixed in with the potting soils or sprinkled on the surface. Containers can also be fertilized by adding liquid plant food to water, to be applied during routine watering. There are different types of fertilizer to use with flowers and vegetables. You will need to check fertilizer labels to ascertain which is best for your plants. Insects get everywhere, and containers in the backyard are in these little critters domain! If you’ve cleaned previously used containers before using them, and haven’t used old potting mix that might be contaminated with disease or insect larvae, you will have reduced the risk of pests at the get go. But you won’t necessarily have warded them off indefinitely. Check your pots and containers regularly for telltale signs that pests are about - spider webs, snail and slug trails, and leaves that have been partially eaten away. Identify any pests you find on your plants, and use an appropriate insecticide spray to clear them. There are some simple routines you will need to follow, to help control the growth and the health of your plants in addition to the points raised above. Pinch or cut off any dead blooms. This is a process called dead-heading and it helps the plant stay healthy and to continue producing flowers. This isn't practical for very small plants - you'd be at it all day - and the simpler solution would be to cut back the stems and let them re-grow to bloom again. Removing dead blooms give plants a well-groomed appearance and keeps them growing bushier. Routinely tidy your containers by removing any dead leaves. If any of your plants are fading away, remove them and plant something new. Larger plants may need pruning to remove disease or damage, or to restrict growth when they start becoming too large. These steps will help keep your containers looking tidy and your plants healthy. Containers make the best use of limited space. They can be located wherever it is not possible to have a garden - e.g cemented areas, poor or boggy soil, decks, patios, stairs & balconies. Not much space is required for the pots. Containers can be moved to follow sunlight, or to change emphasis within the yard, or to make space for entertaining. Invasive plant species are better controlled. Less issues with weeds in containers. Less physical effort is required. Container gardens can be created quickly. Regular watering needed - very important. Potting soil quality is different than regular soil and it costs more. Potting soil to be replenished each year. Some containers can be expensive. Plants more vulnerable to low temperatures. Expensive containers could be stolen. Pot size can limit plant growth. Plants may need to be transfered to larger containers to stimulate growth. Setting up a container garden in your backyard, is a great way to add visual appeal to your yard and to enjoy the taste of homegrown fruit and vegetables if you are into edible gardening. It's not rocket science but you'll be doing yourself a favor if you think through what you want first, and plan your container garden before starting it. It's not difficult and it's a lot of fun. You'll be creating a yard feature in a limited space, and to get the most from the space you have, it makes sense to spend a little time on planning it first. You'll have plenty of choices to make with plant and container types, locations and planting out. Use plant height, color combinations and pot design to create interest and special features. Container gardening is an enjoyable way to make your backyard a special place for you and your family. I hope you enjoy yours!